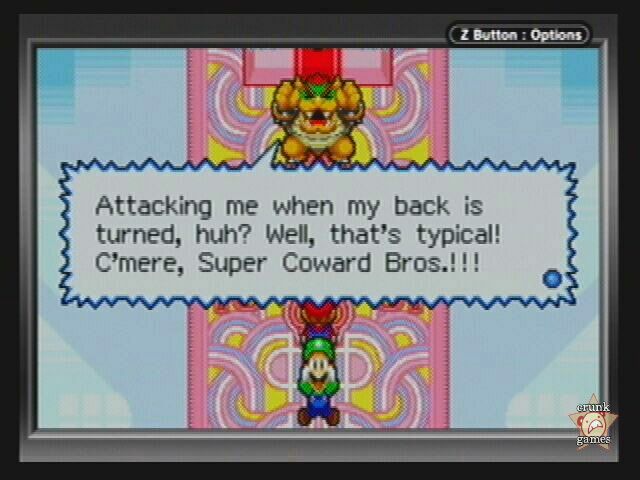 The Marios head to Beanbean Kingdom to defeat a sinister witch and restore Princess Peach’s fair voice. For 20 years, the Mario Brothers have been keeping themselves busy: constantly fighting Bowser, racing karts, having parties, playing sports, hosting Car Talk — but they haven’t had a big adventure together for more than a decade. Who knew that it would take an outside developer to pick up Nintendo’s slack and bring the two siblings together again for a third RPG adventure that gives Luigi some overdue equal time. 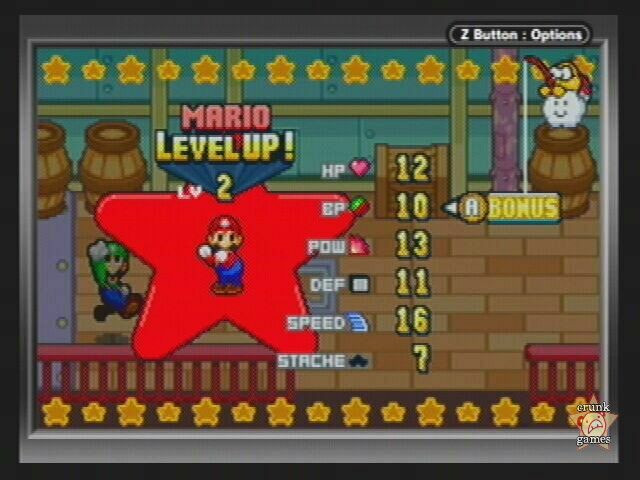 Previously responsible for the average but similarly themed Tomato Adventure, Alphadream has honed their skills and come through in crafting Mario & Luigi, which more than makes up for TA and is one of the most enjoyable GBA games this year. Most Mario games have frivolous stories (yes, even the RPGs), and while M&L isn’t much different, it does strive for freshness while borrowing parts from Super Mario RPG and Paper Mario. It all begins when a gift from the neighboring Beanbean Kingdom is offered to Princess Peach, except it turns out to be an evil jack-in-the-box that steals her voice, and the friendly representative from Beanbean is actually a notorious witch named Cackletta. 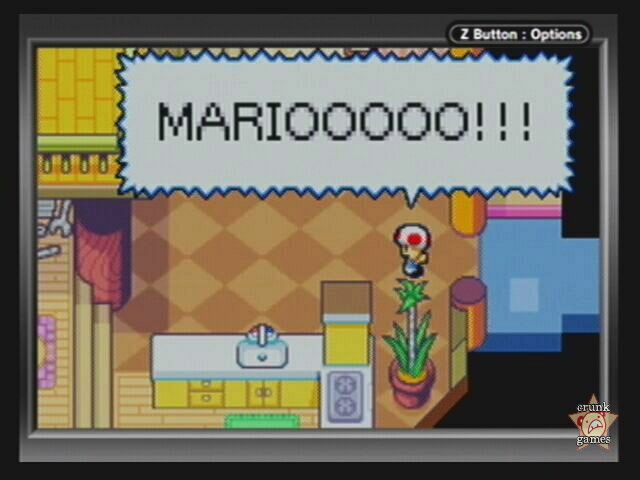 Peach’s voice has now been replaced with exploding symbols, so Mario is called in to right the wrongs. When he arrives, he finds Bowser, disappointed that he can’t kidnap Peach this time around due to her dangerous vocal stylings. Bowser and Mario head towards Beanbean Kingdom, (literally) dragging along the reluctant Luigi with them. As it turns out, retrieving her voice won’t be the brothers’ main mission, and with a couple more twists on top of that, it all adds up to a rather unique experience. 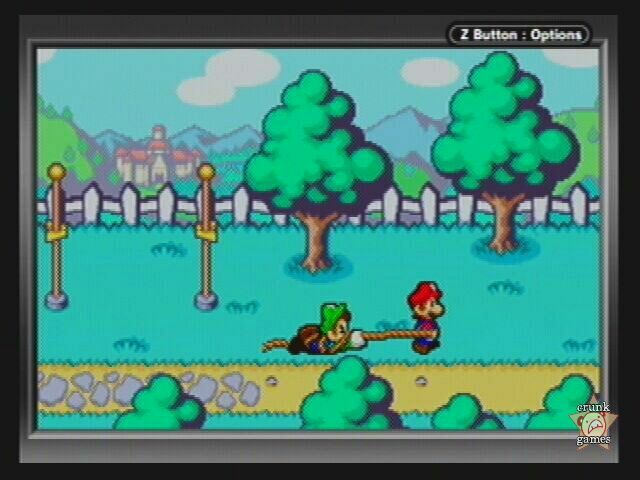 Like its predecessors SMRPG and Paper Mario, M&L is an RPG with a strong Mario element in the gameplay, namely jumping and hitting blocks. The twist here is that you can practically play as both simultaneously; one button will make Mario jump, the other Luigi, and you can switch between the two at will. 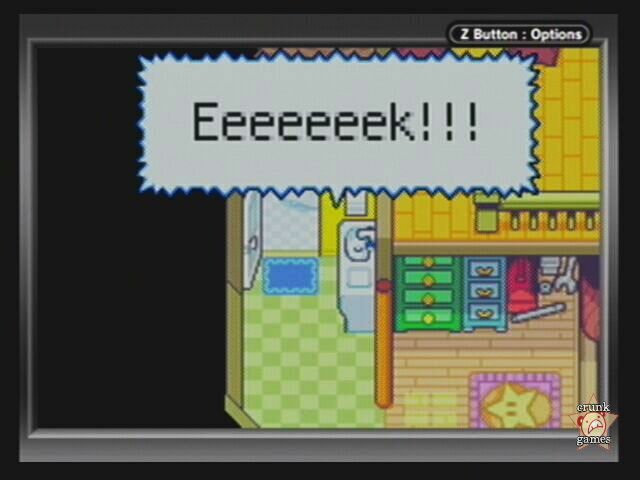 This is not just some frivolous gimmick, as it ties directly into the game, specifically in regards to the multitude of puzzles you’ll face while walking around Beanbean, involving everything from hammering one brother into the ground to sneak under a gate or filling Mario with water so you can douse a flaming haniwa. In battle, you can not only jump and dodge the same way, but also eventually use Bros. attacks, more powerful teamup attacks that require more button dexterity. I found myself using them more in boss fights rather than normal battles, which unfortunately had me learning new attacks a bit slower, but they’re effective once you get the timing down. The most defining feature in Mario & Luigi has to be its immensely self-referencial humor: For starters, hardly anyone recognizes Luigi, preferring to call him "Mr. Green" or other vague names, but only the most devoted followers of the two know him by name. And even though the brothers are in a new land, there are still lots of familiar sights. Bizarre enemies like Tanoobas (tail-wearing goombas) and the viruses from Dr. Mario, places like a room filled with blocks from other Mario games, a Mushroom Kingdom "immigrant" town with a flagpole at the door to its castle … there’s also a healthy mix of visual gags, mostly coming from Mario and Luigi’s quirky animations. You’ll be seeing much more, of course, but to make it easy for you: this game is insane. Classic Mario tunes besides main theme are also present, with selections from everything to SMRPG to even SM64, but M&L mostly relies on original melodies that are sadly sometimes a little more grating than they should be.